The information presented on this page was originally released on March 18, 2016. It may not be outdated, but please search our site for more current information. If you plan to quote or reference this information in a publication, please check with the Extension specialist or author before proceeding. STARKVILLE, Miss. -- As the movement toward buying local food continues to grow, consumers may wonder if this trend is actually benefiting the environment. A 2011 U.S. Grocery Shopper Trends Survey reported that consumers were motivated to buy local food for a variety of reasons, including freshness, taste, support of the local economy, knowledge of food sources and concern for the environment. To understand the environmental impact, let’s start with the basics. The 2008 farm bill defined local or regional agricultural products as those transported less than 400 miles or within the state where they were produced. However, many consumers consider local food to be produced within a 100-mile radius. Conventionally produced food in the U.S. travels an average of 1,500 miles from the farm to consumers. Transporting food a shorter distance means saving energy costs and reducing greenhouse gas emissions. If two farming systems and methods of food transportation are exactly the same, locally grown food would have greater benefits for the environment. However, most farming systems are not the same, and how food is grown impacts the environment much more than how it is transported. How food is grown accounts for 83 percent of greenhouse gas emissions throughout the production process. It may actually require less energy and other inputs to grow food in its proper climate. Transporting food halfway across the world may require less energy than growing the same food in a heated greenhouse with irrigation and fertilization. The production process is not equal for all types of food. For example, the fertilizer demands are different among crops, some plants require much more water than others, and some produce requires more processing after harvest. You can reduce your personal or household impact on the environment by choosing foods that require fewer resources to produce. As a consumer, knowing how your food is grown is the most important way to be environmentally conscious. If food is produced using sustainable practices, then it is sure to have more environmental benefits than conventionally produced food. Local food systems also keep more local land in production and put money back into the local economy. Small farms are often more diverse in what they produce, adding biodiversity to the landscape. Increased biodiversity, a signature of healthy ecosystems, enhances insect diversity, pollinator habitat, and soil and water quality, among many other benefits. Having a variety of farm environments also provides important wildlife habitat. Mississippi is rich with local produce. Our state boasts plenty of open green space, natural resources and the proper climate to grow a wide variety of produce. You can become a more environmentally savvy consumer just by making smart choices at the grocery store or by checking out local food options. The U.S. Department of Agriculture reported 3,706 registered farmers markets in 2004. By 2014, that number had more than doubled to 8,284 registered farmers markets. 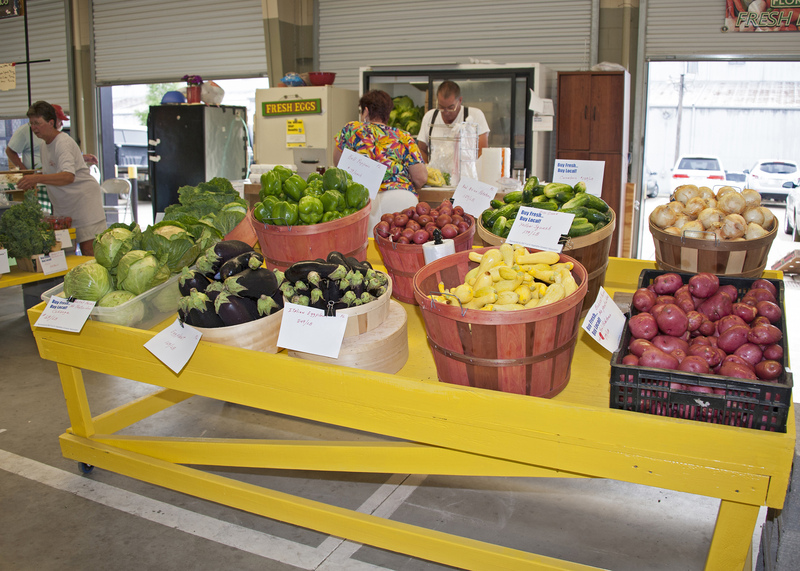 In Starkville, you can find local produce at roadside stands, the Farmer’s Market, nearby “pick-your-own” farms and community-supported agriculture operations. You may even find co-workers or neighbors who are producing extra food and want to share.